Waste Management, Inc. (Houston, TX) is advising investors against accepting a so-called "mini-tender offer" by TRC Capital Corporation which seeks to buy up to 3 million or about 0.65 percent of its outstanding common stock at $33 per share. The company said that TRC's offering price is 4.62 percent below its closing share price as of August 20, the day prior to the offer which is subject to many conditions. The company further cautioned investors that mini-tender offers, in general, are structured to avoid many of the investor protections required of bigger offers with the US Securities and Exchange Commission (SEC) and other procedures under US securities laws. Waste Management, Inc. has been notified of an unsolicited "mini-tender offer" by TRC Capital Corporation to purchase up to 3 million shares, or approximately 0.65 percent, of outstanding Waste Management common stock at $33.00 per share. TRC Capital's offer price is 4.62 percent below Waste Management's closing share price on Aug. 20, 2012, the day prior to the offer. The offer by TRC Capital is also subject to numerous conditions. Waste Management is not associated with TRC Capital, this mini-tender offer or the offer documentation. Waste Management does not endorse the offer and recommends against stockholders tendering their shares in response to this offer. TRC Capital has made many similar mini-tender offers for shares of other companies. Mini-tender offers, such as this one, are third-party offers that seek to acquire less than 5 percent of a company's outstanding shares. These offers avoid many of the investor protections afforded for large tender offers, including the filing of disclosure and other tender offer documents with the U.S. Securities and Exchange Commission (SEC), and other procedures required by U.S. securities laws. Waste Management recommends that stockholders who have not responded to the TRC Capital offer take no action. Waste Management further recommends that stockholders who have already tendered shares in TRC Capital's offer withdraw their shares by providing the written notice described in the TRC Capital offering documents prior to the expiration of the offer, currently scheduled for 12:01 a.m. Eastern time on Thursday, Sept. 20, 2012. 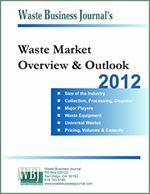 Waste Management urges stockholders to obtain current market quotations for their shares, review the conditions to the offer, and consult with their broker or financial adviser. The SEC has advised that bidders making mini-tender offers at below-market prices are often, "hoping that they will catch investors off guard if the investors do not compare the offer price to the current market price." The SEC's guidance to investors on mini-tender offers is available at: www.sec.gov/investor/pubs/minitend.htm. 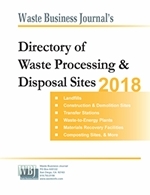 Waste Management encourages stockbrokers and dealers, as well as other market participants, to review the SEC and New York Stock Exchange recommendations on the dissemination of mini-tender offers. These recommendations are available at: www.sec.gov/divisions/marketreg/minitenders/sia072401.htm and in the information Memo Number 01-27 issued by the NYSE on Sept. 28, 2001, which can be found under the "Regulation - NYSE - Rules & Interpretations - Information Memos" tab at www.nyse.com.